Faculty Senate Chair at CCNY. Expert in the areas of turbomachines, explosion and implosion,turbulence and underwater launchers. Interests include the fifth dimension, speed of mind, and intelligence. Turbulence in rotating flows, wakes, corner flows transition and transient flows in turbomachinery erosion - corrosion - deposition from contaminated hot gas flows. M.S. (Hons), Mechanical Engineering, 1969, PFU, MOSOW, U.S.S.R.
Ph.D. Aerospace, 1974, Penn. State. 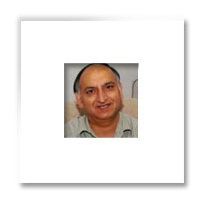 Professor Raj has published more than eighty technical papers and coauthored seven books. He developed for the first time the turbulence dissipation equation applied to rotating flows and showed that it is not independent of rotation. His wake models related to cascade, rotors and free stream turbulence are first in the field of turbomachinery. He discovered two non-dimensional parameters Gibbs Time and Gibbs Number to quantify explosion-implosion. He was appointed twice fellow of NASA and four times the distinguished fellow of U.S. Navy. At NASA his work involved new fuels in space for long range flights. While he was in the Navy his work involved advanced launching systems, sonar, transient flow pumps, and underwater explosion-implosion phenomena. He has collaborated extensively with industry in the areas of erosion, corrosion, and deposition from highly contaminated, high temperature gas flows and development of high temperature new turbine. He has also examined most fundamental problems; transition from conservative to non-conservative field, highly accelerating rotating flows, ram-pump- mid stroke rumble, and concepts beyond relativity. He has served as a consultant to the United Nations in the field of turbomachinery and also chairman of ASME’s IGTI’s coal utilization committee. He has lectured extensively internationally. Thermo-Fluid Systems Analysis and Design, 3rd Ed, 2014, GI Corp. Practical Chemistry - An Easy Way to Learn Chemistry, International Edition 2014, GI Corp.